The Skin Effect Heating system is an electrical heating system using the AC phenomenon with a remarkable effect on the inner surface of a ferromagnetic tube. The heating element is a plastic insulated conductor inside a ferromagnetic carbon steel tube. 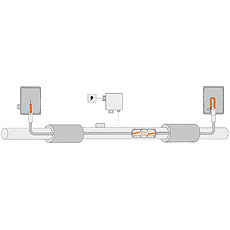 The heating circuit is to be designed to any needs by variation heat pipe size, electrical conductor size, supply voltage and insulation material. BARTEC provides the complete component range and a full package of documentation. The typical applications of SEH systems are temperature maintenance, frost protection and heating-up of long pipelines. All parts of the system are grounded providing additional electrical safety. Power feeding point equipment is designed and constructed customized, according to project requirements. When increased power output is necessary several runs can be installed.